GrubHub Inc. (GRUB) slipped to a loss in the fourth quarter from a profit last year, due to higher costs and expenses. The results missed analysts’ expectations. Following this, the food delivery giant’s stock dropped more than 14% in the premarket session. Net loss was $5.15 million or $0.06 per share compared to a profit of $53.5 million or $0.60 per share in the previous year quarter. Non-GAAP earnings plunged 48.6% to $0.19 per share. Revenue surged 40% to $288 million. Gross food sales grew 21% year-over-year to $1.4 billion. Active diners increased 22% to 17.7 million and daily average grubs grew 19% to 467,500. Looking ahead into the first quarter of 2019, the company expects revenue in the range of $310 million to $330 million and adjusted EBITDA in the range of $40 million to $50 million. 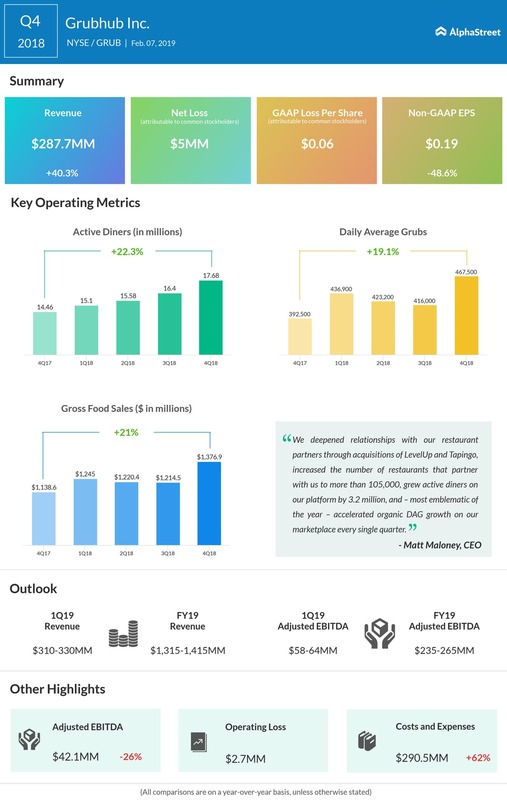 For the full year 2019, GrubHub expects revenue in the range of $1.315 billion to $1.415 billion and adjusted EBITDA of $235 million to $265 million. For the fourth quarter, total costs and expenses increased 62% as the company is spending more to establish itself in the $200 billion takeout industry. GrubHub is spending more money to beef up its reach and marketing efforts for maintaining its market share in the food delivery space. GrubHub is facing stiff competition from Uber Eats (UBER), DoorDash, Postmates and Square’s (SQ) Caviar. The company has been responding to its rivals historically by acquiring companies like Tapingo, LevelUp, Seamless, Yelp’s Eat24 and many smaller firms. With changing food habits and consumer preferences, online food delivery market is going to grow around the globe. In the fourth quarter, the company announced meaningful incremental investments in marketing and the launch of new GrubHub Delivery markets. These strategic investments have laid the ideal foundation for long-term profitable growth. GrubHub also expects this to help generate meaningful operating leverage throughout 2019, with per order economics likely similar to the previous quarter. Shares of GrubHub opened lower on Thursday and is trading in the red territory. The stock has risen over 1% in the past year while it has fallen over 23% in the past three months.